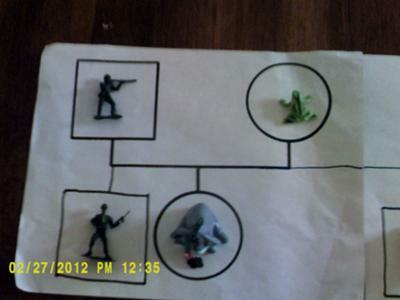 My play therapy genogram was hard for me to find the right miniature that represents each person in my family. 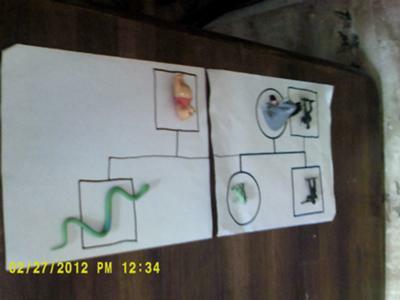 I only did my family of origin for the play therapy genogram. My dad is represented by an army many that has his rifle up and is ready to protect whatever needs to be protected. This is how I always saw my dad. He was my protector. He has always been my safe place. My mom and him divorced when I was three and whenever he was on leave and for I month in the summer he would “swoop” in and save my brother and I from the abuse we received with my mom and step dad. 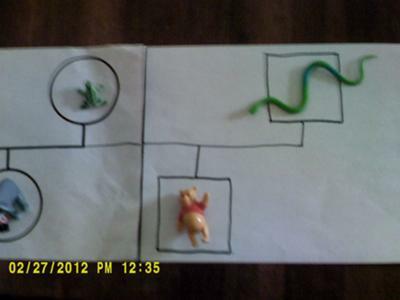 My mom is a green frog because I see a frog as something that comes and goes as it pleases them. My mom was not around a lot when I was a kid. She worked second shift and she would be asleep when we got up for school and would be gone when we came home from school. My mom and I are best friends now. My whole brother is also an army man. He was in the army but if you notice there is a “wounded” place on his chest, that is because he was also abused. He and I were very close when we were children. I am Eeyore because Eeyore is always sad and alone and for most of my childhood I felt sad and alone. My ex step father is the snake. He is a snake because he is the main one that abused me and my whole brother. My half brother is Pooh. I see Pooh as happy and care free. His father did not abuse him and I always felt he had a good early childhood with his father (things are different now).